Whether a complex roof like the one shown above, or a simple flat roof, the method of construction is essentially the same. The initial substrate would be tongue & groove or 18mm plywood, covered by a liner material to reduce friction between the copper and the wood. There are then two basic fitting methods: the roll baton or standing seam methods. When using the roll baton method, batons are securely fixed to the deck, forming the bays which are a characteristic feature of these roofs. The copper bays are formed to the exact specifications of your roof, and fixed into the prepared bays. Cappings and trims are welted on to provide a watertight seal at all the joins. Using the standing seam method, the copper is secured to the roof by the means of stainless steel clips, fitted between the upstands of the copper bays, which are then welted together. 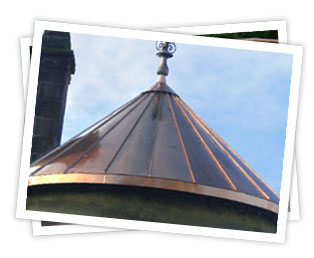 You can view examples of our copper roofing in our portfolio, or contact us for further details.